You’re celebrating New Year in Times Square. You’re on a mountaintop temple at dawn. You’re watching a solar eclipse with a crowd. The chances are, wherever you go, and whatever you do, you will have your phone in your hand. We are now in the age of social video, where creating and sharing video YouTube, Facebook, Snapchat and Instagram has meant mobile video traffic almost doubling in 2017. Around 80% of all Internet traffic from users in 2018 will be from video. Travellers are a huge part of that mix. HUGE. Your videos likely already look incredible, but that microphone in your smartphone is terrible – it’s only designed to capture your voice. So why not make your videos sound incredible, too? Making your videos look better is important, but what if they sounds out-of-this-world awesome? That’s exactly what binaural recording does, creating video that, when played back through any pair of headphones or earphones, has stunning 3D sound. There are already some mobile binaural 3D sound recording headsets on the market, most notably the Sennheiser Ambeo smart headset we had a look at last Spring, but the Hooke Verse are the first that are wireless. Unlike the wired-for-iOS-only Sennheiser Ambeo smart headset, Hooke Verse uses Bluetooth, so works with Android, GoPro, DSLRs and field recorders as well as iOS. 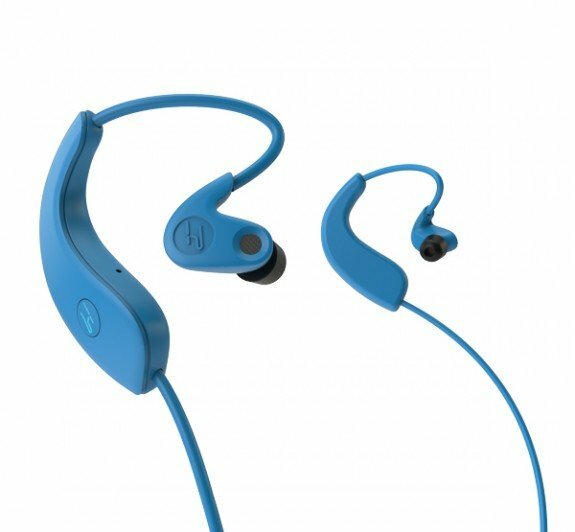 Each earpiece has a built-in binaural microphone capable of recording 3D audio. You can also use them to make hands-free phone calls. Weighing just 20g, they look and feel like a pair of sports Bluetooth earphones, the kind you hook around the top of your ear. They ship with a small protective case, though it’s slightly tricky to get the earpieces snugly into the moulded inserts inside (this video helped). The Hooke Verse are not the most comfortable earphones you will ever wear; TravGear found them tricky to fit quickly, with some occasional slippage. It’s also difficult to wear a hat whilst wearing the Hooke Verse. It’s not critical, but the fit is definitely the area Hooke Audio need to work on most of all for the second iteration of the Hooke Verse. With the Hooke Verse strapped-on, and the Hooke Audio app installed on an iPhone 7, TravGear headed for a city center to make some 3D recordings. It’s pretty easy to do; you link to the Hooke Verse via Bluetooth, fire-up the app, and suddenly you’re shooting video – and listening to the input from the two mics. This monitor mode means that everything is going OK, and you can adjust the noise levels. A small ‘3D’ icon appears, and you’re good to go. When filming, it’s really important to think of your own head as the microphone, which means angling your head exactly to wherever you point your smartphone. For instance, there’s no point holding your phone out at arms length, or to the side of you while you take video––your head needs to be right there behind your phone so the 3D audio checks out OK. Once you press stop to cease recording, the video appears in a small library, as well as in the camera roll. The videos can be shared absolutely anywhere, with one massive proviso; you MUST listen to them through a pair for headphones – any headphones (or earphones) – to get the binaural 3D sound effect. The results in our test were impressive, with a real ‘as-if-you-were-there’ feeling. However, the results are novelty value in some senses; don’t expect studio-quality immersion like the BBC have been doing of late. In fact, you don’t even have to shoot video; those into soundscapes can just record in binaural quality (it’s arguably even more immersive than video because you have to use your imagination … which is always going to be better than your smartphone’s camera). During our tests, the Hooke Verse behaved erratically enough – including losses of connection and app crashes – for us to figure-out some ground rules for its stability. Firstly, it’s best if you put your phone into aeroplane mode, and enable only Bluetooth, but way preventing any spotty cell service from interrupting with the wireless connection. It’s also best if you close all open apps on your phone. The Hooke Verse isn’t perfect; the wireless nature of these earphones does bring an element of instability unless you’re careful, and how impressive the sound effects are will depend on where you go and what you choose to record. However, being able to take a binaural recording device on your travels is exciting, and the fact that it’s been done in a small, travel friendly, wireless design is impressive indeed. Is binaural video the missing link in virtual reality? One thing’s for sure; your travel video will never be the same again.